Put my son to bed tonight and all went well. See my post on our bedtime routines, it works for us 99% of the time. This made me think of sharing some of our favourite bedtime stories with you. We have a few that we usually choose from. One of the best features common to all of these books is that there is some degree of repetition (I guess that is common to a lot of children’s books). What our son like about this repetition is that he can memorize certain sentences and know when they are coming up, so reading the book together becomes and interactive experience that he really enjoys. 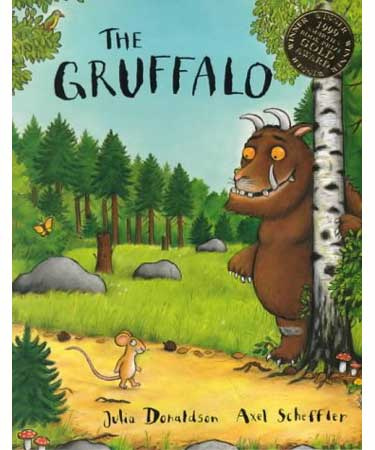 1) The Gruffalo, by Julia Donaldson – recommended for children 2 years and up. This is a classic book with a nice story about a quick-thinking mouse that outwits a fox, an owl, a snake and of course, a Gruffalo! It has good repetition of certain elements, and the sentences in the story also rhyme (in an AABBCC… fashion), so after just a couple of times reading this, our son could already start to complete some sentences on his own as I was reading them. 2) Wanted: The Great Cookie Thief, A Sesame Street book – this one is a bit hard to find but can still be found online. Our copy is actually the copy that I had when I was just a young tike, so reading this brings back memories of my childhood. Our son also loves it because it is about one of his favourite topics… cookies… and it also has some repetitive aspects, so he can predict what is going to happen next. 3) Room on the Broom, by Julia Donaldson – another one by the author of The Gruffalo. We actually bought this one first and liked it so much that we bought the Gruffalo. This is a really nice story about a witch that takes a dog, a bird and a frog with her on her broom, along with her cat, and when they meet up with a dragon, they all help to rescue her. There is a great theme of friendship and cooperation. Like the Gruffalo, this story rhymes and has repetition, so we can have a good interactive read. 4) The Ernie and Bert Book, A Sesame Street Book – like the Great Cookie Thief, this is another classic from my childhood that our son loves. It can still be found online, not sure if it is in any stores any longer. This one was at the top of our list for awhile. Our son practically had it memorised because we read it so many times. This is the story of what happens when Ernie broke the piggy bank, so he had to put the money in the cookie jar, and the cookies in the milk bottle, and the milk in the… you get the idea. It goes on like this and is lots of fun. 5) Speedy Fire Engine, A Wheelie Boards Book. This book is shaped like a fire engine and has wheels. It is a simple story that rhymes. It is just a few pages about a fire engine that quickly goes to put out a fire. I think our son mostly likes this one because he likes fire trucks. Today he kept repeating, “Speedy Fire Engine!” about a million times. He also likes to turn the wheels on this book as I am reading it to him. So that is our current top five… I would definitely recommend checking these out if you are looking for some new books for your kids and don’t have these already. Join the jam and tell us your favourite bedtime books!